The future can’t come soon enough for Honda. The Japanese automaker plans to start domestic sales of its first production hydrogen fuel-cell vehicle, the Clarity, by next March. There’s a problem, though, according to Honda, in that the Japanese government is taking longer than it needs to in order to finalize hydrogen refueling station regulations, according to Bloomberg News. Japan’s economy ministry is responsible for such regulations, which would help make Prime Minister Shinzo Abe’s goal of a mass uptake in fuel cell vehicles a reality. Honda, for its part, is working with hydrogen supplier Iwatani Corp. on what’s called a Smart Hydrogen Station, but there are currently only two in Japan that are being used for testing purposes. Some of the regulatory questions involved with refueling stations involve issues such as what materials can be used to store the hydrogen and how far the stations need to be from the roads. Japan’s economy ministry says such questions will be answered by the end of March 2016. Toyota is already committed to ramping up production of its Mirai fuel-cell vehicle from about 2,000 units to this year to as many as about 30,000 by the end of the decade. Honda, which has been leasing its FCX Clarity fuel-cell vehicles in limited numbers for many years now, is starting to produce the Clarity with a production rate of about 200 units a year, for now. Honda said in early November that Clarity sales should reach the US by the end of next year. Honda is not going to target regular consumers with the Clarity during the first year, at least in Japan. Honda says that it will work “mainly” with local governments and business customers that have shown an interest in hydrogen technology and will begin sales to individual customers “later.” The five-seat Clarity Fuel Cell will come in three colors: Premium Brilliant Garnet Metallic, White Orchid Pearl, and Crystal Black Pearl. We got to take a brief drive in the FCEV this past week, and you can read more about the technological advances in the new Clarity (the smaller fuel cell stack, the powertrain packaging, etc.) here. 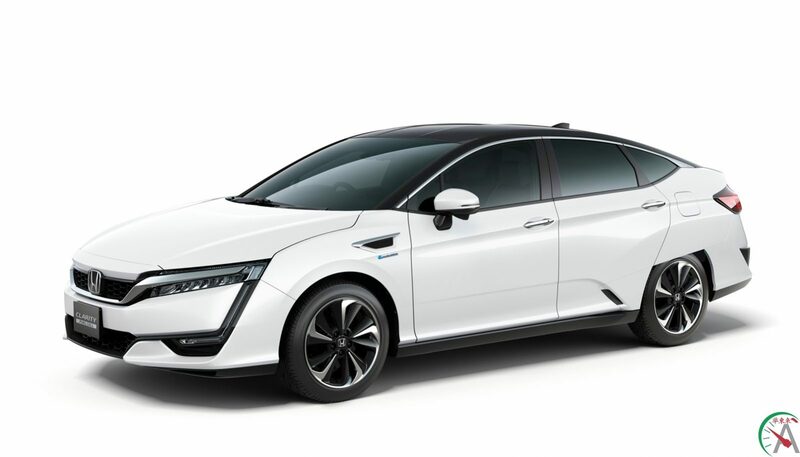 The fact that Honda consistently calls the new car the Clarity Fuel Cell (as opposed to simply the Clarity) gives us reason to think that the upcoming PHEV and all-electric models will not only share a chassis, but also perhaps a name. Clarity EV, anyone? © 2016 JDM AUTOTrademarks and brands are the property of their respective owners.